Many theories have been put forward concerning the Curse of King Tut including the possibility of the use of poisons or toxins in the protection of the tomb of the boy-king pharaoh. Whether or not poisons were deliberately used as protection devices by the Ancient Egyptians is highly debateable but recent laboratory tests have revealed that some of the ancient mummies found in tombs do carry mold, or bacteria and it is believed that poison was used in the coatings of tombs or in powders which were released into the air when stones were disturbed. It is, however, very difficult to establish whether the poisons are of ancient origins. What is certain is that any studies, investigations and examinations of Ancient Egyptian tombs, coffins and mummies are now undertaken in accordance with strict safety precautions including protective clothing. In 1999 a German microbiologist called Gotthard Kramer added some scientific credence to the Curse of King Tut. Gotthard Kramer studied over forty Ancient Egyptian mummies and identified several potentially dangerous mold spores. He put forward the theory that when ancient tombs were first opened the fresh air together with the general movement of people could have disturbed the spores which would have been blown into the air. The mold, or bacteria, could then have caused health problems particularly to people with a weak immune system. Lord Carnarvon died of septicaemia (blood poisoning) after nicking a mosquito bite with his cut-throat razor. His immune system was so weak that he developed pneumonia which was the ultimate cause of his death. The above molds, or bacteria, can be particularly harmful for people with weakened immune systems such as Lord Carnarvon. The above toxins can also cause symptoms similar to pneumonia. `It is definitely possible that the ancient Egyptians use atomic radiation to protect their holy places. The floors of the tombs could have been covered with uranium. Or the graves could have been finished with radioactive rock. 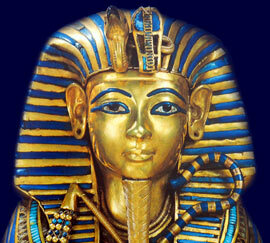 Rock containing both gold and uranium was mined in Egypt. Each section of the website addresses all topics and provides interesting facts and information about the Golden Age of Pharaohs and of Egypt. The Sitemap provides full details of all of the information and facts provided about the fascinating subject of the Pharaoh Tutankhamun and the role of the Poisons in the legends and myths surrounding the Curse of King Tut.